An existing cancer drug could offer an alternative treatment to patients with macular diseases. As physicians, we all know the importance of being reimbursed and paid for services rendered, procedures performed, and medications prescribed. That said, it is equally important, now more than ever, to be cognizant of how we spend limited health care dollars. Unfortunately, we do not always have the luxury of prescribing treatments based on our judgment and experience. Sometimes, insurance companies and government agencies have a say in the matter. This article takes a close look, from global health and financial perspectives, at the anti-VEGF drugs retina specialists administer for the treatment of macular diseases. • Ziv-aflibercept could represent a new option for patients who respond suboptimally to bevacizumab. • Ziv-aflibercept may have a role in countries with budget-limited drug formularies, but, in order for that to happen, clinical trials assessing safety and efficacy will be necessary. Ranibizumab (Lucentis, Genentech) has been approved by the US Food and Drug Administration (FDA) for intravitreal use for the treatment of wet age-related macular degeneration (AMD), macular edema following retinal vein occlusion (RVO), and diabetic macular edema (DME). Bevacizumab (Avastin, Genentech), on the other hand, was initially approved by the FDA for systemic administration for the treatment of metastatic colorectal cancer. Bevacizumab is a much larger molecule that was thought to be unable to cross the retina effectively, but it does, and it has consequently been used off label to treat a variety of exudative macular diseases including AMD, diabetic retinopathy, and RVO. Regeneron developed a recombinant fusion protein VEGF inhibitor, aflibercept (Eylea), for ophthalmic use, and another fusion protein, ziv-aflibercept (Zaltrap), for treating metastatic colorectal cancer. The primary difference between the two drugs is osmolarity—aflibercept’s osmolarity is 250 mOsm, and ziv-aflibercept’s osmolarity is 820 mOsm.4 There is also a significant difference in cost, which I will address below. Marmor studied hyperosmotic solutions in lapine eyes and found that 1000 mOsm concentrations caused retinal detachment and permanent retinal degeneration.5 The weakest solutions causing ophthalmoscopically visible changes had an osmolarity of 500 mOsm, which is lower than that of ziv-aflibercept. Thus, the conventional wisdom was that ziv-aflibercept, at a higher-than-safe osmolarity, would be toxic to eyes and could not be used safely as an alternative to aflibercept. However, this was not the case. Lapine eyes are one-third to one-fourth the volume of human eyes, so the 0.05-mL injection of hyperosmolar solution in the rabbit studies would be diluted three- to fourfold in a human eye. This would reduce osmolarity into a physiologic range, which explains the lack of toxicity noted in the case reports and small series discussed here. What does this mean moving forward? The cost savings potential is huge, especially in countries with limited health care resources. Both bevacizumab and ziv-aflibercept are packaged in 4-mL vials, yielding approximately 65 doses of 0.05 mL per 4-mL vial after repackaging and holding several syringes for sterility testing. The repackaging fee charged by the compounding pharmacy is about $12 per syringe. A 4-mL vial of ziv-aflibercept costs about $1600 (compared with $700 for a vial of bevacizumab). This means a cost of $25 for a 0.05-mL dose of ziv-aflibercept combined with the repackaging fee, resulting in a cost per syringe of $37. This is slightly more expensive than a similar dose of bevacizumab ($23 per syringe), but still far less than a single dose of aflibercept, which costs $1850 per dose. In the United States, aflibercept and ranibizumab are readily available and reimbursed by most insurance plans, including Medicare—as long as they are used on-label for FDA-approved indications. 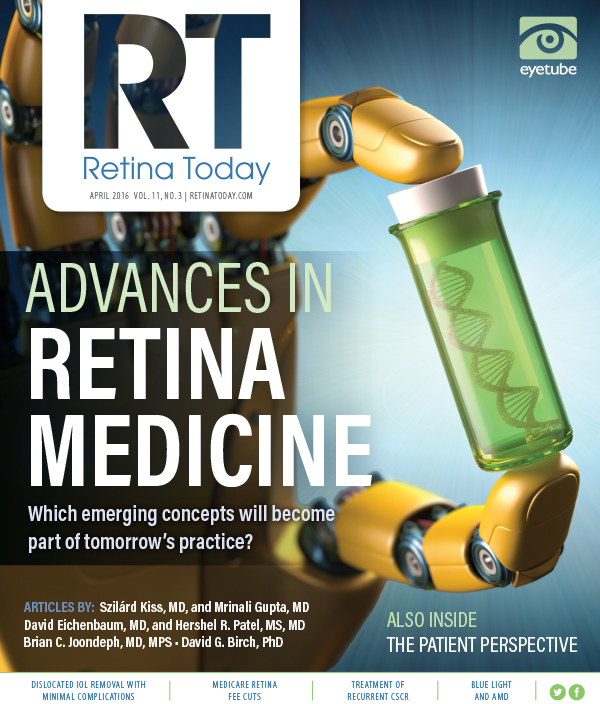 According to the American Society of Retina Specialists’ 2015 Preferences and Trends survey, 20% of US retina surgeons would choose aflibercept as first-line treatment for a patient with vision-affecting macular edema, 16% would choose ranibizumab, and 61% would choose bevacizumab.11 It is important to note that there is pressure on surgeons to choose a less expensive alternative to the two on-label drugs. Many insurance plans are narrowing their provider networks based on cost of care, dropping providers who are considered higher cost because they prescribe more high-cost injectable drugs. Furthermore, the FDA is tightening regulations on compounding pharmacies, which could threaten or even eliminate access to repackaged bevacizumab or ziv-aflibercept. Where ziv-aflibercept may have a role is in countries with budget-limited drug formularies. I have the privilege of practicing in New Zealand a few weeks each year, working at the public hospital in Auckland. There, repackaged bevacizumab is available and on formulary for exudative macular diseases, much the same as in the United States. Ranibizumab and aflibercept are available only on a limited basis, subject to strict treatment criteria and committee approval. There is much less physician leeway to try another drug in a patient who has a suboptimal response to bevacizumab. Next steps for any country wanting to add ziv-aflibercept to its formulary would be to organize a clinical trial, per a standard protocol, treating patients who have had a suboptimal response to bevacizumab with ziv-aflibercept. Safety data would have to be collected, along with efficacy, watching for safety issues such as cataract progression, glaucoma, inflammation, infection, and other adverse effects. Pending a country’s regulatory determination that ziv-aflibercept is not causing harm, the indication for use could then be expanded to treatment-naïve patients. The process will vary in each country, but the precedent has been set with approvals of bevacizumab. 1. Martin DF, Maguire MG, Ying GS, et al; CATT Research Group. Ranibizumab and bevacizumab for neovascular age-related macular degeneration. N Engl J Med. 2011;364(20):1897-1908. 2. Martin DF, Maguire MG, Fine SL, et al; CATT Research Group. Ranibizumab and bevacizumab for treatment of neovascular age-related macular degeneration: two-year results. Ophthalmology. 2012;119(7):1388-1398. 3. Hutton D, Newman-Casey PA, Tavag M, et al. Switching to less expensive blindness drug could save Medicare part B $18 billion over a ten-year period. Health Aff. 2014;33(6):931-939. 4. Chang JS, Albini TA, Moshfeghi AA. Ziv-aflibercept as a possible alternative to aflibercept. Retina Today. 2014;9(5):67-68. 5. Marmor MF. Retinal detachment from hyperosmotic intravitreal injection. Invest Ophthalmol Vis Sci. 1979;18(12):1237-1244. 6. Farah ME. Pre-clinical investigations of intravitreal Zaltrap. Paper presented at: Angiogenesis, Exudation, and Degeneration 2014 meeting; February 8, 2014; Miami, FL. 7. Dias JR, Xavier CO, Maia A, et al. Intravitreal injection of ziv-aflibercept in patient with refractory age-related macular degeneration. Ophthalmic Surg Lasers Imaging Retina. 2015;46(1):91-94. 8. Chhablani J. Intravitreal ziv-aflibercept for recurrent macular edema secondary to central retinal venous occlusion. Ind J Ophthalmol. 2015;63(5):469-470. 9. Mansour AM, Al-Ghadban SI, Yunis MH, et al. Ziv-aflibercept in macular disease. Br J Ophthalmol. 2015;99(8):1055-1059. 10. Chhablani J, Narayanan R, Mathai A, et al. Short-term safety profile of intravitreal ziv-aflibercept [published online ahead of print December 11, 2015]. Retina. 11. Rezaei KA, Stone TW, eds. American Society of Retina Specialists. ASRS global trends in retina. www.asrs.org/content/documents/2015_global_trends_in_retina_survey_-_for_website.pdf. 2015. Accessed March 11, 2016. • a partner at Colorado Retina Associates and a clinical professor of ophthalmology at Rocky Vista University College of Osteopathic Medicine in Parker, Colo.